Outgoing Chief Justice, (Ag) Ian Chang, declared in a ruling, yesterday, that Minister of Citizenship Winston Felix and Junior Minister of Labour, Keith Scott by virtue of their status as elected members of the National Assembly cannot sit in Parliament as Technocrat Ministers. The PPP had objected to the appointment of Scott and Felix as Technocrat (expert or skilled in their field) Members of the National Assembly following the last year’s General and Regional Elections. The party, via a statement, had contended that “Articles 103 (3) and 105 of the Constitution and Laws pronouncing on the eligibility of appointment of Technocratic Ministers, do not confer Technocratic status on these persons already sworn in by President David Granger as Ministers”. The matter was filed by PPP member, Desmond Morian. Morian also questioned the appointment of APNU+AFC members Felix and Scott to Parliament as Technocrat Ministers. The application cited Articles 60, 103, 105, 160 and 232 of the Constitution of the Cooperative Republic of Guyana, Chapter 1:01. He had contended that the names of the two Ministers were not extracted from the coalition’s list of candidates; hence they did not fit the criteria for the positions. Morian essentially sought a declaration from the court barring the two members of Government from sitting in the National Assembly as Technocrat Ministers. The applicant was represented by Attorney at Law, Anil Nandlall. Attorney General, (AG) Basil Williams and the Speaker of the National Assembly, Dr. Barton Scotland, are named as respondents. 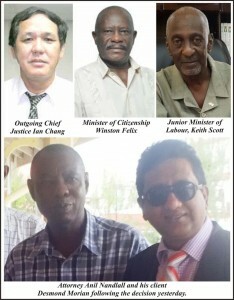 In the 15-page ruling yesterday, Chief Justice, (CJ) Chang outlined that the Court sees it fit to grant Morian the application on the basis that Felix and Scott are elected members of the National Assembly but despite that status, they do not hold seats and cannot sit in Parliament as Technocrat Ministers since their names were not extracted from the APNU /AFC list of successful candidates. Additionally, Chang granted a declaration that Article 105 of the Constitution has no application to elected members of the National Assembly that is persons whose names were on the successful list of candidates. The CJ also noted that despite their appointment by President David Granger to be executive members of the Government, such an executive appointment does not entitle Felix and Scott to hold seats or sit as Technocrat Ministers. The applicant Morian and his Attorney Anil Nandlall were present at the hearing yesterday. Attorney Prithima Kissoon appeared on behalf of the Attorney General. In an invited commented Nandlall asserted that the ruling represents the incompetence of the present administration. “If the Government cannot properly, accurately and legally put the right persons to sit in the Parliament how can they tackle important issues on behalf of people of this nation?” Nandlall questioned. He held that there is significant triviality with which serious decisions are treated. The Attorney told media operatives that the decision to select Felix and Scott as Technocrat Minister was obviously not done with care and consideration for what is written in the Constitution. When contacted yesterday, Attorney General Basil Williams expressed shock that Justice Chang returned to the Court to rule on a matter which has political bearing. Williams contended the CJ is supposed to be on pre retirement leave and not on the bench. Justice Chang proceeded on pre retirement leave last December. He is set to officially retire later this month. But Minister of State Joseph Harmon said that the Chief Justice still has the right to preside over the matter until he officially retires at the end of the month. Harmon said that the ruling is not something that the government can accept. He said that the Government is of the view that the Ministers were properly appointed hence the administration in poised to challenge the decision at a higher level of the Courts.